Read about this great site “curiouspages” on “hilobrow” the other day. It’s dedicated to all the lovely, inappropriate books written for for children before the vanilla world of new age began. One great post was on Margaret Wise Brown’s “The Dead Bird”. Direct and downbeat, it’s a winner. It made me think of the books I read as a child. If I didn’t read those books the world would be a funny, sunny place filled with angels, butterflies and pretty photographs of carousel animals. Thank god for Edward Lear, whom I discovered as a kid in my grandfather’s study–the same grandfather who corrected my wretched pronunciation of the French poet, Rimbaud, after I rambled on how much I loved him. “Rambo, my dear,” he said and took another sip from his gimlet. So, I’d sit on his old Chesterfield sofa, glance curiously up at the human skull on the shelf and rest my feet on the dog skins on the floor then read Lear for an hour or two. I especially loved his Latin botanical series: “Nonsense Botany” where he drew nonsense superfluous plants and gave them fake Latin names such as “queerifloria-babyoides”, the above illustration. 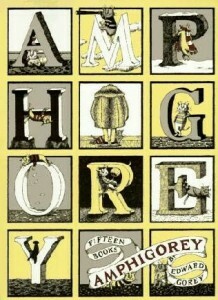 A year or two later, I discovered Edward Gorey who of course was influenced by Lear. My heart beat a thousand times when I first saw a bearded, gray haired fellow reading, “The Black Flag of Anarchy” (I kid you not!) while working as a teenager at an ice cream joint on Cape Cod. There he was sitting at the counter, wearing a long, woolly fur and simple white tennis shoes. I knew it had to be Gorey, aside from the coat, he had on several rings (he had a thing for large, strange brass rings in the shape of odd looking animals) and a lovely, little golden earring in his right lobe. I nervously glanced at him but said nothing, I was too shy. I prayed he would return the next day so I could bring in my copy of “Amphigorey” for him to sign and sure enough he did. I approached him and shyly asked him to sign my book. He said, of course or something to that effect and promptly signed it. And that was that. After that, I merely poured him coffee day after day and never engaged him–simply too shy. I lost that copy of Amphigorey and although I received other things signed by him later, I’m always a little sad I don’t have that one anymore. Here’s to Gorey and Lear! be able to have the confidence to come up with great ideas and do your best work. in the Kennedy Center Terrace Theater. you possibly can setup ssh key auth and write a script that can remote into each machine to difficulty a shutdown command. These are simple classes and the object is to have fun while exposing the women to artists and totally different art methods. conclusion of movies so terrible which you have to watch. am just now working on, and I have been at the glance out for such information.